"Pork and tart dried cherries make a great meal for a cool fall evening. Prepare your salad or other side while this casserole finishes in the oven." Preheat oven to 350 degrees F (175 degrees C). Butter a 2 1/2-quart casserole dish. Mix apple, chicken broth, cherries, walnuts, stuffing mix, celery, onion, and melted butter together in a large bowl; transfer to the prepared casserole dish. Heat olive oil in a large, non-stick skillet over medium-high heat. 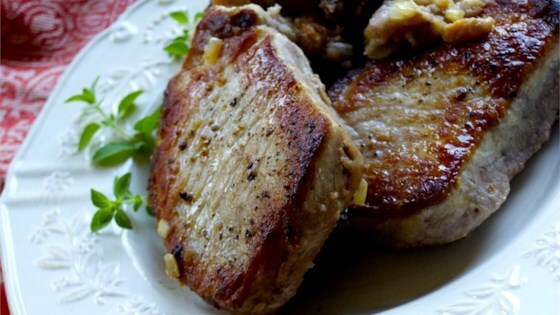 Cook pork chops in hot oil until browned on one side, 2 to 3 minutes. Arrange the chops atop the stuffing mixture with the browned side facing up; press into the stuffing. Cover dish with aluminum foil. Bake in preheated oven for 25 minutes. Remove aluminum foil and continue baking until pork chops are cooked through, about 10 to 15 minutes more. An instant-read thermometer inserted into the center should read at least 145 degrees F (63 degrees C). Came out perfect! I cut the recipe down for a smaller family and it was delicious. Stuffing was just moist enough without being soggy.